Dorothy Weir Walker Bush (July 1, 1901 – November 19, 1992) was mother to 41st President of the United States, George H. W. Bush, and the grandmother of 43rd President of the United States, George W. Bush. Time on her death wrote that "George [H. W.] Bush was shaped and tempered by his mother's nature." Dorothy Bush raised her five children in a strongly religious home. During her childhood she attended church as many as three times each Sunday. She was born near Walker's Point, in York County, Maine, to George Herbert Walker and Lucretia "Loulie" (Weir) Walker (1874–1961), daughter of James H. Weir. Dorothy Walker's family is unrelated to the colonial New England (local) Walkers that settled York County, Maine, and are buried in Kennebunkport, the Berwicks, and in York. Walker attended Mary Institute, and married Prescott Sheldon Bush on August 6, 1921, in Kennebunkport, Maine. 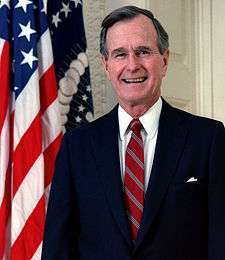 They had five children: Prescott "Pressy" Bush, Jr. (1922–2010), George H. W. Bush (1924; named after Dorothy's father, George Herbert Walker), Nancy Bush (1926), Jonathan Bush (1931), and William "Bucky" Bush (1938). Her mother Lucretia Wear was descended from French Huguenots (Gabriel and Marie Hersent Maupin) who arrived in America in 1700. Dorothy Walker Bush died at age 91 in Greenwich, Connecticut, on November 19, 1992, only 16 days after her son lost the 1992 presidential election to Bill Clinton. She is interred with her husband Prescott Bush at Putnam Cemetery in Greenwich, Connecticut. ↑ Wead, Doug (2005). The Raising of a President: The Mothers and Fathers of Our Nation's Leaders. Simon & Schuster. ISBN 0-7434-9726-0. ↑ Sidey, Hugh (November 30, 1992). "The Presidency.". Time (magazine). Retrieved 2007-11-20. George Bush was shaped and tempered by his mother's nature. His was a soul finally formed by strata of love and discipline relentlessly laid down. Bush was lucky, so very lucky, to be rooted in a woman like Dorothy Walker Bush, who died last week at 91. ↑ "Dorothy W. Bush, Mother of President, Dies at 91.". New York Times. November 20, 1992. Retrieved 2007-11-20. Dorothy Walker Bush, the mother of President Bush, died shortly after 5 P.M. yesterday at the family's house in Greenwich, Connecticut, after suffering a stroke. She was 91 years old. 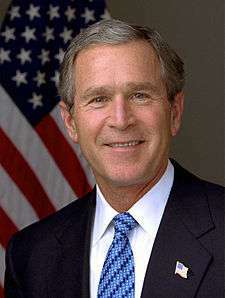 ... Mrs. Bush also reared her children in a strongly religious home, a reflection of her own childhood during which she is said to have attended church as many as three times every Sunday. 1 2 Philadelphia, Desa (August 7, 2000). "The Family Tree". Time (magazine). Retrieved 2007-11-20. The most competitive Bush, she bred in her children the drive to win and the rule never to brag about it. While in the White House, her son called her every day.